Regardless of whether you are a fan of Apple’s Siri or prefer to use Google’s Voice Search on your device, it looks like giving audible commands to a smartphone or tablet is definitely here to stay and will play an increasingly important role in how we interact with our devices. 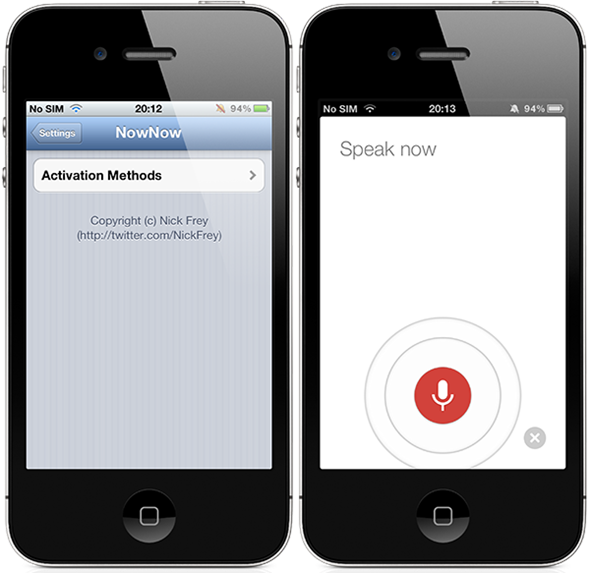 We have recently seen a video comparison showing Siri and Google Voice Search going head-to-head and now we are seeing the release of the NowNow jailbreak tweak that is designed specifically for those who want to quickly invoke Google’s Voice Search on their iOS device. Google has recently updated their iOS app with improved voice searching capabilities, making it a worthy contender to Siri for web based searches. Obviously it doesn’t have access to any private device or user data, so it can’t handle appointment and calendar requests, but as a voice searching engine, it is extremely proficient. The NowNow tweak is a simple Activator based way for users to quickly get access to those searching features without having to manually locate and invoke the app itself. When the tweak is first installed, an Activator method will need to be assigned via the native Settings app on the iOS device. Using this method quickly launches the Google Search app and immediately starts the voice search function, ready to accept audible commands from the user. Although, Siri natively has a lot more power, the app and tweak work harmoniously together on older devices and firmware that don’t actually support Siri, making it a perfect combination for those users. 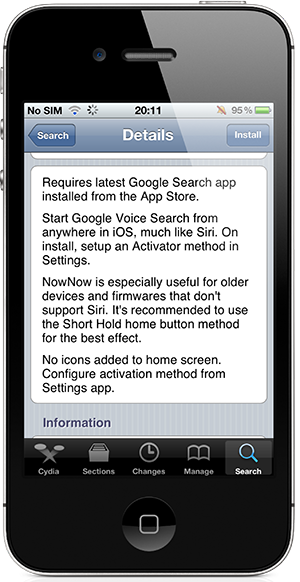 In addition to the great support for older devices, the Voice Search and NowNow combo works perfectly for those who do nothing more than searching the web using voice commands. Apple’s Siri can be quite infuriating and lethargic when needing to perform a web search, whereas the Google app does everything in one window at lightning fast speed. NowNow is available as a free of charge download from the BigBoss repository and requires the latest version of the Google Search app to be installed on the device.